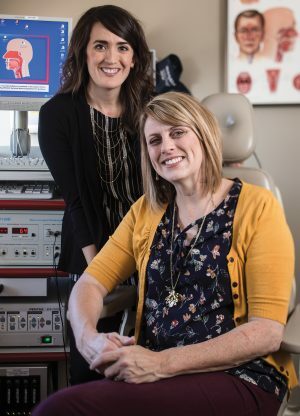 Sharla Morgan (standing), a nurse practitioner at the Thyroid Institute of Utah, has a special relationship with Kimberli Seely, who found a lump in her neck after watching a video about Morgan’s own experience with thyroid cancer. Photo by Bradley Slade. Morgan soon learned that the lump was suspicious for cancer, and within a week she was in surgery to have her thyroid removed. Being in the right place at the right time helped save Morgan’s life, but she never thought her story would help save another’s as well. Soon Seely found herself sitting in her doctor’s office speaking with the nurse-practitioner, who asked how Seely had discovered the small lump and determined to have it checked out. As Seely described the video she had seen, she made a sudden realization. “I looked at her, and it was almost like there was just this light bulb, this connection between the two of us,” Seely says. “You know, that video was about me,” the nurse-practitioner, Morgan, told her.